"Music was my medicine. 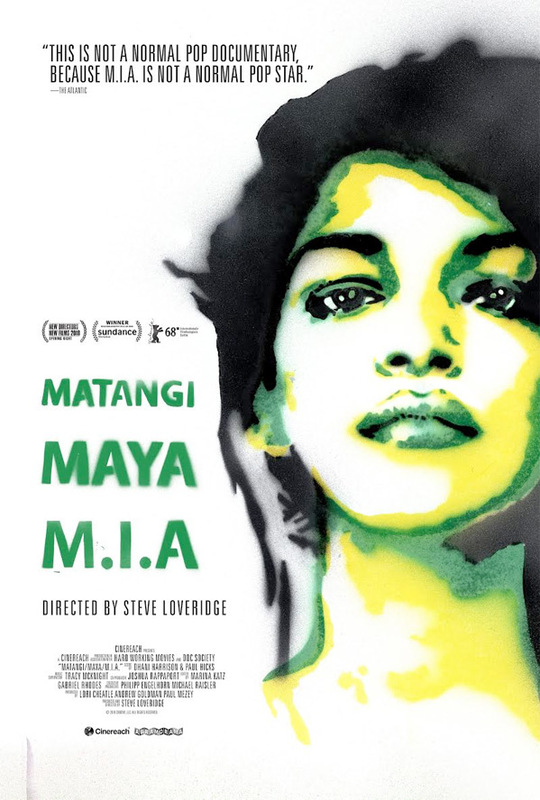 It just blew up so quickly…" Abramorama has released the first official US trailer for a documentary titled Matangi/Maya/M.I.A., a profile of the badass Sri Lankan singer / songwriter / rapper / musician / artist / activist known as M.I.A. Her real name is Mathangi "Maya" Arulpragasam, and this deeply personal film takes us into her life, her childhood, her upbringing, and her story as she becomes famous around the world, and encounters resistance when she starts speaking out against issues that are dear to her. This premiered at the Sundance and Berlin Film Festivals this year, where I first saw it. I wrote in my glowing review: "this seems like a film that is another music documentary about a pop star and her rise to fame and fortune and glory. But it's anything but that. It's actually a much more personal, intimate story of a young woman who wants to bring attention to and raise awareness about very dire problems in the world, and injustices, and do so using the power of the microphone." This is definitely a worth watching doc. Drawn from a cache of personal video recordings from the past 22 years, Matangi/Maya/M.I.A. is a startlingly personal profile of the critically acclaimed artist, chronicling her remarkable journey from refugee immigrant to pop star. She began as Matangi. Daughter of the founder of Sri Lanka’s armed Tamil resistance, she hid from the government in the face of a vicious and bloody civil war. When her family fled to the UK, she became Maya, a precocious and creative immigrant teenager in London. Finally, the world met her as M.I.A. when she emerged on the global stage, having created a mashup, cut-and-paste identity that pulled from every corner of her journey along the way. Never one to compromise on her vision, Maya kept her camera rolling throughout. Matangi/Maya/M.I.A. provides unparalleled, intimate access to the artist in her battles with the music industry and mainstream media as her success and fame explodes, becoming one of the most recognizable, outspoken and provocative voices in music today. Matangi/Maya/M.I.A. is directed by British filmmaker Steve Loveridge, making his directorial debut. This first premiered at both the Sundance & Berlin Film Festivals earlier this year (read our review). Abramorama will release Matangi/Maya/M.I.A. in select theaters starting on September 28th in the fall.